Fianna Fáil Spokesperson on Environment and Local Government, Barry Cowen TD (centre), with Dublin City Councillors Deirdre Heney and Paul McAuliffe launching a new Fianna Fail policy document entitled ‘Generation Rent – A New Deal for Renters and Landlords’. 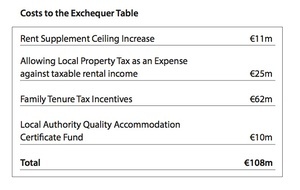 The document [at link below] sets out a number of new policy initiatives that “will help people struggling in the rental market, ensure quality accommodation and rent certainty”. Costings above. There are 100,000 people on housing waiting lists nationally, more than 42,000 in Dublin alone. This didn’t happen overnight. Lots of these people have been waiting on a home for ten years or more. Lack of affordable housing is not a ‘problem’ for government, they depend on it to drive up rent, property and land prices. This government has figured out that to have a reasonable chance of reelection, it need only pander to its core base of the comfortable class, many of whom are landlords or have a vested interest in a booming property market (as do many TDs themselves). People on housing waiting lists don’t vote for Fine Gael. Those that did vote Labour in the hope that their needs would be addressed have been rightly stuffed as Labour presided over an 82% cut to social housing provision budgets between 2007 and 2014. This chronic under-funding coupled with the more than €170 million euro of cuts to rent supplement since 2010 has created a whole new class of homeless people. The victims of this dysfunctional market include families forced to live with their in-laws or in temporary accommodation, and professionals who cannot afford to buy in metropolitan Dublin, and are pushed ever further out into the commuter belt. There is also a growing homelessness problem. In a country where home ownership is the norm, or at least the aspiration, for most families, housing could become an acute political problem ahead of a general election within about six months. Posted in Misc and tagged Fianna Fail, Homelessness at 4:11 pm on August 20, 2015 by Broadsheet. A) These measure are unlikely to do anything significant about the problem. B) The figures make no sense whatsoever. C) These measures will only help landlords. The state needs to take a more active role in the provision of social & affordable housing. We need to finish & release NAMA accommodation in certain areas. It needs to stop seeing property speculation as a primary driver of growth and instead see a well-designed, well-executed, affordable built environment as a platform for the rest of the economy. Yes, I really am starting to think so. I have some sympathy for the idea of leaving social/affordable housing to the private sector but it hasn’t really worked. Indirectly through rent allowance we pay for this building, we pay property developers to borrow at more expensive rates than the govt can do and we pay the profits of property speculators. Then when there’s a crash, we end up paying for it all over again. We still need to help plan, oversee & regulate the works (despite the great hopes for self-regulation) but the relevant skills have often migrated to the private sector. You can go around Dublin and see well-built, well-designed council dwellings (not every single development obviously) from a period when we were much poorer. Our economy (like that of other Anglosphere countries) diverts far too much investment & effort towards property speculation. We might be better off if the state took a much stronger role & allow private investors to invest in other sectors. This is a developing opinion. yes because it’s SO much better to fupp off on yer holliers and not even try/bother to do something about these matters…yes, FG/LAB a great bunch of lads who have nothing to do with the current state of the place atall atall, maybe they can wheel out the minister for August there for some more pearls of wisdom, oh look at the birdys, look at the birdys…no? oh prone communications must be on their holliers too…..
Well said both those quotes! Fine Gael should be turfed out for this crisis of their making. Labour are finished anyway but at least Fine Gael came out and said what their aim was, we cant blame them as being duplicitous or incompetent. Rent controls are unconstitutional. That is a fact. no, it’s a statement until you link the relevant article. there have also been 2 housing acts, a residential tenancies act and 2 sets of miscellaneous provisions since the early 80’s ruling. i doubt blake v the AG would stand today. Rent control is not unconstitutional – rent freezes are. That is a fact. you don’t really fall for election promises do you? election promises are almost 100% false.. very very few are kept. and on top of that, would u really trust FF to keep an election promise? lets not forget, they were the ones who crippled this country in the first place. ive no idea why people are willing to forget that. their actions literally cost lives .. as a direct result of their actions, people literally died. dont forget that. Well said Rob. We should never ever forget that. 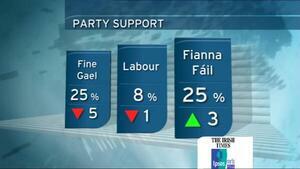 The Irish electorate has a hugely short-term memory and their default is FF. No one minded the corruption or gombeenism for decades. We got the governments we deserved. Anytime someone comes along to make hard choices they get lambasted and people run to the next populist teet. The only thing that gives me hope is that this kind of thing is typical. The real corruption/gombeenism in Ireland occurred during/after the period of growth in the 1960s & 1970s. Similar on a smaller scale to the sort of corruption seen in China today. Better governance seems to follow economic growth & the spread of education. Do for example, there seems to be much more scrutiny & much less tolerance for appointment of well-connected duffers to state boards than there was even a few years ago. Never liked that TV3 logo – I always saw it as tonsils. Now it looks like someone adrift in a boat. Someone two-faced. I wonder what Joan’s next job is going to be. Doesnt need one. Will be riding off into the sunset with her pension. 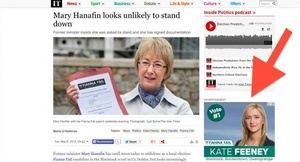 Same as Mary Harney. Will be appearing in public again as a witness to the inquiry. I know politicians need a bit of a brass neck but fupp me, FF really take the biscuit. Barry Cowen especially… it’s his first Dail, right? You’d think he parachuted in from heaven. why are they even still a party? 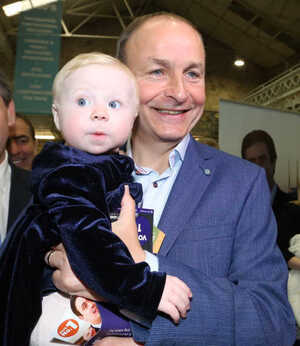 let alone a party regaining a lot of popularity again .. its insane .. they should’ve been broken up and jailed after what they did to Ireland.. why are people so quick to forget? Because the Irish electorate will follow whoever promises them the shiniest things and who will take away the bad taxes. Even when the country was broke/is slowly clawing its way back. is anyone surprised by this mess? has the penny dropped yet that when you vote for the local publican/estate agent/teacher that you would get laws mostly in favor of said professions! If they can have rent controls in New York, one of the most populous cities in the world with almost twice the population of this cesspool, then we can have rent controls. Supply and Demand. I’ll say it again for the slower among you, Supply and Demand. All the pseudo-lefty posturing and populist claptrap won’t alter the unbreakable link between prices, supply and….yes, almost there……..demand. Which is fine, Jake38, ‘cept we don’t live in anything approaching a free market for property. We have bailed out the banks despite property f***-ups, we have a cumbersome eviction process, we have some level of council housing, we have rent allowance, we allow landlords to properties vacant until they fall into disrepair, we have NAMA which owns huge amoutns of property and a substantial impact upon the market, we have a planning process, we have tax breaks on various property-related activities, etc. There are all sorts of ways in which we as a state influence both supply & demand in the market. And try to change any of those and you’d have people in uproar. Calls to Joe Duffy for a week. I listened to Fr McVerry and Sr Stan in the last few days. How are they so absolutely naive after decades in that work?! A crowd of thick necked political reprobates. Bit harsh considering Labour wasn’t even in power for half that period. 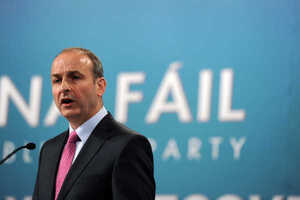 FF were there for 2007-11 – what proportion of the cuts happened under their watch?